Many thanks for what has been an excellent 2018 at BGS. So much has been achieved this year: a continued focus on a strong academic culture via our Effective Learner model, numerous Parent Workshops run by the Crowther Centre, the creation of the Secondary School, our first Rites of Passage camp, record enrolments, the opening of the new Annandale, a refreshed academic uniform and, critically, an ongoing and unwavering commitment to knowing each and every individual boy in our care. Although 2019 might seem some time away, it will be here before we know it, and promises to be another stimulating year. We will continue to focus on those elements that always remain vital to BGS, alongside a number of very exciting developments that I look forward to sharing with you in a few weeks. I wish you, your families and all in the BGS community a happy, safe and holy Christmas, and a great start to 2019. Your support of BGS in 2018 has been greatly appreciated and I look forward to seeing you again in the New Year. I would like to start this week by congratulating Noah McGrath, 2019 School Captain, and Martin Kulesza, 2019 School Vice Captain, both of whom were announced at Speech Night last week. I have no doubt that they, along with the Prefect group, the House Captains and the Year 8 Student Voice Leaders (recently announced at our Final Assembly), will ensure that next year is an outstanding year for Brighton Grammar. We welcome Christian Neeson to the School in the newly created role as Director of Co-curriculum (Years 7–12). Tim Marshall will step down from his role as a Head of House for Year 7 and begin 2019 as Director of Sport (Years 7–12). After a number of acting roles this year, Nicole Clark has been appointed as Head of House (Year 7). Simon McPhee will join the School as Director of Coaching (Years 5–12). Simone Lewis has been appointed in another newly created role as Director of Service. Patrick Sanders will move into the role of Director of Curriculum & Assessment (ELC–VCE) and we welcome Simon Maaser into the Head of Science Faculty role. Louise Carroll is retiring from her role as Head of Humanities Faculty and Yvette Radas has been appointed to the position starting next year. Kristen Molloy will be taking a year’s leave and Peter Pidduck will step into the role of Acting Head of English Faculty. Graeme Harris is retiring from his role as Head of House and a Teacher of Science. We welcome Dennis Rodwell as the incoming Head of Rofe House and also a Teacher of Science. Anthony Keane will be staying at BGS but is stepping down from his role as Head of House. We welcome Maxwell Forbes as the new Head of School House and a Teacher of English. Finally, I would like to end on a personal note of thanks for your support throughout the year. I do hope you all have a peaceful and joyous Christmas time with friends and family. On Thursday, we commenced promotions in the Secondary School. This is always a busy time of year and it requires great organisation to enable the boys to sample their 2019 classes. The day started with the induction of our new Chantologists. Charlie Moore, Fergus Murray and Luke Hart set the scene at the start of the day for the new Years 9 to 12 boys while the new Year 8 students arrived from the Urwin Centre. 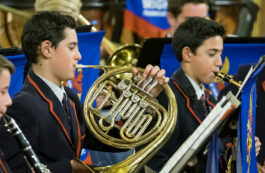 The call of ‘Brighton Grammar’ echoed throughout the Atrium as a prelude for what was to come. All students congregated in the Quadrangle as the Chantologists led the school in chants. The Headmaster was drawn from his office as the chanting grew and he bestowed the Chantology blazers to Head Chantologist Charlie Moore and his team. The bell at the top of the Tower entrance rang out and all students were welcomed to the 2019 year. They were urged to make the most of their opportunities throughout the year ahead. Students then returned to Tutor Groups to prepare for their new classes. Prior to this, on Wednesday afternoon, all Years 7 and 8 students had their Final Assembly together. Year 8 students then met with their new Heads of House and House Tutors in preparation for the Promotions period. A large number of these boys have already had some classes at the St Andrew’s end of the School but for some it was a new experience. Thank you to all Heads of House and to Cam Taylor, who worked hard before this day to finalise tutor groups and ensure a smooth transition period into new House groups. A large number of boys new to the School have also had a chance to familiarise themselves with how things operate before commencing fully in 2019. This weekend, 36 OELP nominees gave up their time to embark on the Stage 1 training course for 2019. With help from Ray and Julian at Adventure Curve, the nominees worked through a series of team challenges and professional development tasks, including public speaking and constructive feedback sessions. Tackling inclement weather, the Year 11s worked as a team, maintaining a high standard and proving their aptitude for leadership. Finally, on Tuesday, the boys put what they had learned into practice by welcoming the new Year 7 students to Secondary School with an afternoon of team activities on the Crowther. Highlights included the leadership challenges, a team barbecue dinner and visits from Ross Featherston, Rachel Horton and Peter Tellefson, who shared their viewpoints on the significance of service, the value of mentoring and the importance of student voice. The Outdoor Education Leaders Program (OELP) is a three-stage student mentor program that places Year 11 students with a class of peers from Years 3 to 8. The Year 11 leaders walk alongside staff and build relationships with the younger students, helping them through their own BGS journey and, ultimately, accompanying them on their Outdoor Education experience. 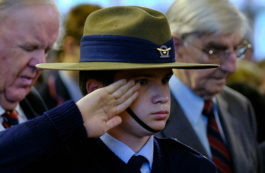 This program is designed to cultivate our young men as they step up as mentors and examples for the BGS student community. We look to shift the perspective of the OELP members from participant to student leaders. I am excited to welcome the new OELP students as representatives of our department. I’d also like to thank the outgoing cohort of OELP students for their outstanding service to their younger peers and their efforts in strengthening BGS and extending the ‘As One’ message across New Street and Allee Street. The highlight of the festive season at Brighton Grammar is the Community Carols Service, which was held on Monday 3 December in St Andrew’s Church. Featuring a number of well-known carols, as well as Christmas readings and a selection of Christmas songs, the evening celebrated the work of the 130-strong combined Borwick House, Meliora Voices and Senior Choirs, Corelli Strings, Senior Concert Band and Senior Symphony Orchestra. Soloists this year included Zac Murphy (Year 4), Jordan De Worsop (Year 11), Joel Dow (Year 10) and Jonty Leadbeater (Year 12). The Head Shave Challenge was a huge success! The event kicked off with Mr Sanders saying a fond farewell to his beard while Charlie Paterson was lucky enough to shave Mr Bain’s head – a reward for raising almost $800! Dr Lee, Leo Kouskouris, Joe Catalano and Ayrton Alessandro all followed with new hair cuts! Thank you, gentlemen – great work. Crepes were flying out the door thanks to Crêpes for Change, a not-for-profit social enterprise, with all funds going to support youth homelessness. The Ultimate Frisbee staff vs student match drew crowds but after a heated contest, it was the teachers who managed to take home the win. For those interested in a more chilled lunchtime, we had Kyle from Brightside Art working with students on street art style designs on slate decks and boards. A special thank you must go to Joel Dow, Ryan Thorpe and Lachie Briggs for performing at the event. The boys helped create a very relaxed atmosphere for all to enjoy. Thanks also to ‘Marshall Chef’ and his crew. Your team ran a tight and faultless ship, ensuring bellies were filled. We had a group of about 20 volunteers set up and sort bags to be distributed through the ‘It’s in the Bag’ drive, run by Share the Dignity. These bags will be donated to women who may be experiencing hardship at this time of year. Raffle tickets are available until the end of tomorrow on the go fund me page ($2 for one or $5 for three). You can win vouchers for Mama’s Buoi or Açai Bros, or original prints from Kyle at Blindside Art. All of this could not have happened without the help of a small group of young men who have wanted to make a difference this year. From coming up with great ideas and assisting with advertising designs to selling raffle tickets, you have done it all. Henry Williams deserves a final thanks for coming up with the Head Shave idea and being willing to back it. Never let anyone tell you that you cannot make a difference, gentlemen. As a school, we have managed to raise over $5000 to be donated to the Les Twentyman Foundation. These funds will be used to support young people and assist them into secure housing and education. School transition can be a very exciting and stressful time for parents and students. This week’s SchoolTV provides interviews with leading specialists, helpful articles and fact sheets about school transitions. If your son will not be needing his laptop after the end of this year, the community of Pormpuraaw would be grateful to have it. Please take your old laptop to ICT so that the team can wipe the drive and prepare it for donation. If you have any queries, contact our Director of ICT, Sandra Maher. Whatever your child is interested in, there will be something to inspire them in the Share Summer Holiday Programs. Check out what’s on offer this December and January. Programs are booking out already so be quick! Box, cycle, HIIT or downward-dog your way into shape at your community gym in Annandale. You’ll love the small class sizes, superb setting and community atmosphere. Our highly qualified trainers are offering free fitness assessments to help you plan your goals and work out which classes suit you best. Visit the Annandale Gym website for the Christmas timetable. The Shop will re-open on 7 January 2019. Opening hours for January will be available on the Noone and BGS websites soon. Noone’s experienced staff fit the boys for growing room. However, if your son happens to grow significantly over the holiday period, you can exchange any uniform item.